Mobile-first internal communication platform for your mobile-first workforce. Bring your team. Increase staff engagement, productivity and efficiency. 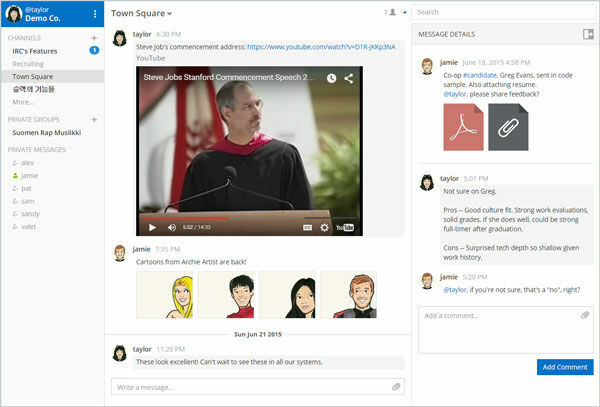 A messaging platform built for teams. 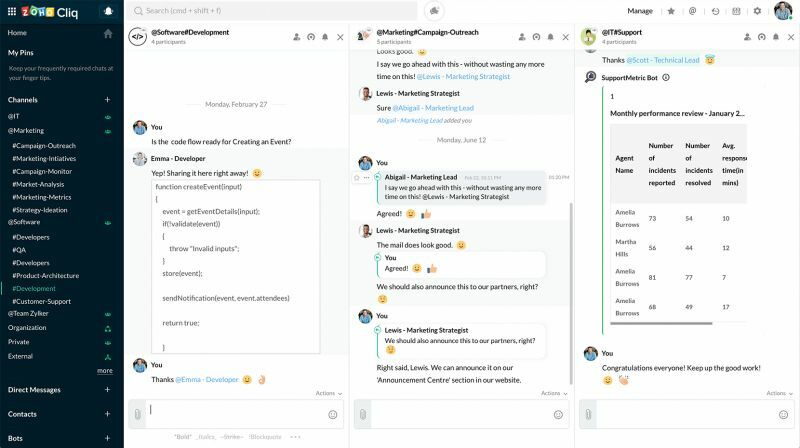 Whether in a 1:1 chat or a dedicated group workspace, Hangouts Chat makes it easy to collaborate with your team in an organized way. Share and discuss Docs, Sheets, and Slides all in one place. Zoho Cliq combines content and communications into a single view to give you a comprehensive picture of your team's work. Zoho cliq is designed to let information flow freely to bring about that much required transparency to work. 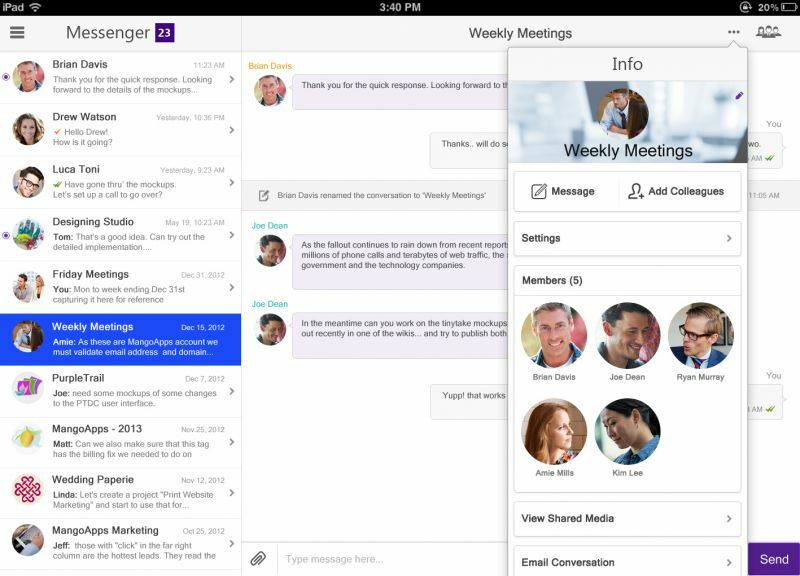 Plan, share, & organize work in real-time. 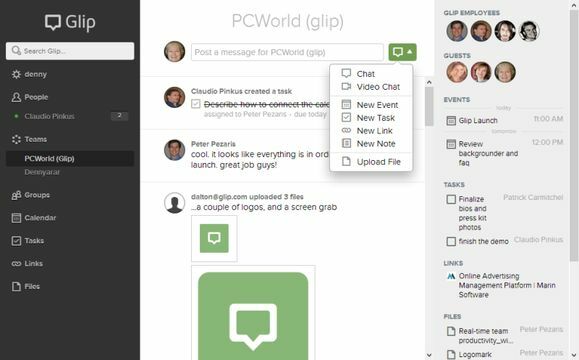 Glip organizes your team’s work while you chat with your co-workers, and makes your conversations productive. All your projects, meetings and files live in the stream, so everyone is in the loop on what’s happening. Jumpstart team productivity. Everything you do is protected by Symphony’s unique end-to-end security. Enhance your messages with rich editing, images, tables and files. Hashtags, cashtags and mentions - never miss an important message with personalized filters. 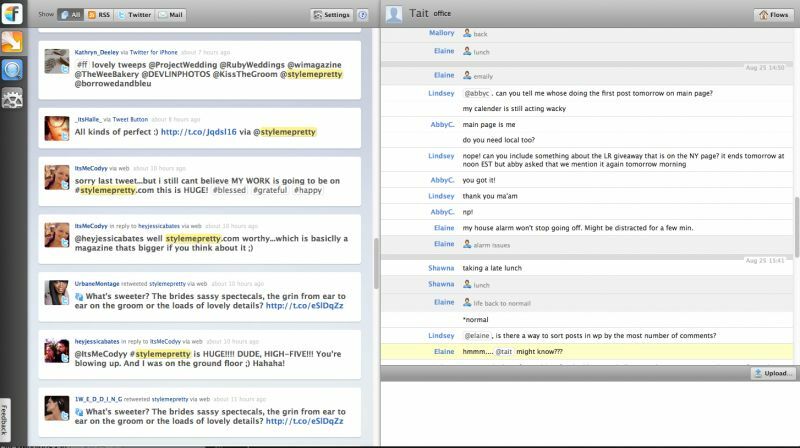 Secure access to your conversations on your desktop or on your iPhone. Take your conversations with you, wherever you go. Stay connected to your colleagues and don't miss a discussion anymore - the ChatGrape mobile apps for iOS and Android will keep you updated and let you join the conversation easily, no matter where you are. Reference all data from your external services from within ChatGrape right as you type - with an autocomplete that knows your business. 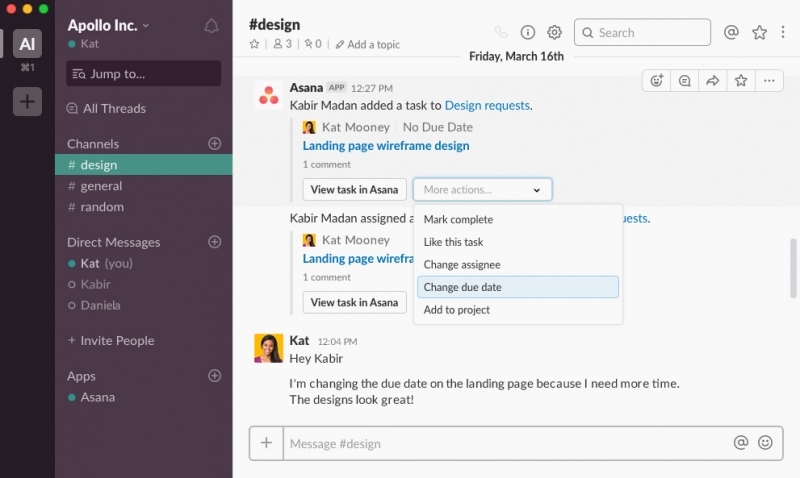 Slack announced new integrations with Microsoft OneDrive and Outlook. 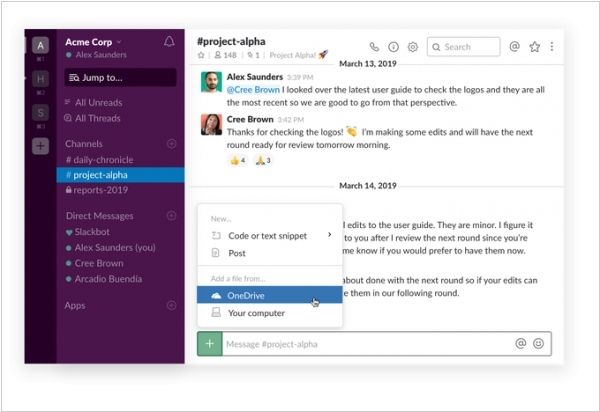 Specifically, Slack is integrating calendar, files and calls and bringing in integrations with other services, including Box, Dropbox and Zoom. 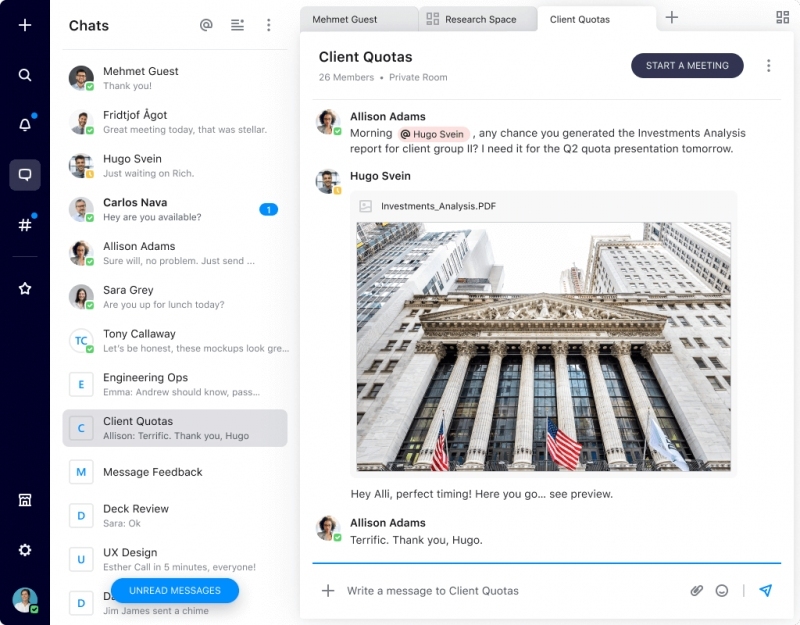 For starters, the company is announcing deep integration with Outlook that enables users to get and respond to invitations in Slack. 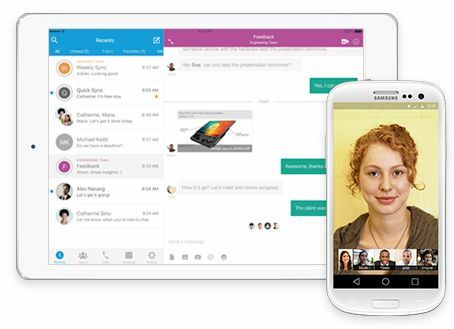 You can also join a meeting with a click directly from Slack, whether that’s Zoom, WebEx or Skype for Business. What’s more, when you’re in a meeting, your status will update automatically in Slack, saving users from manually doing this (or more likely forgetting and getting a flurry of Slack questions in the middle of a meeting). 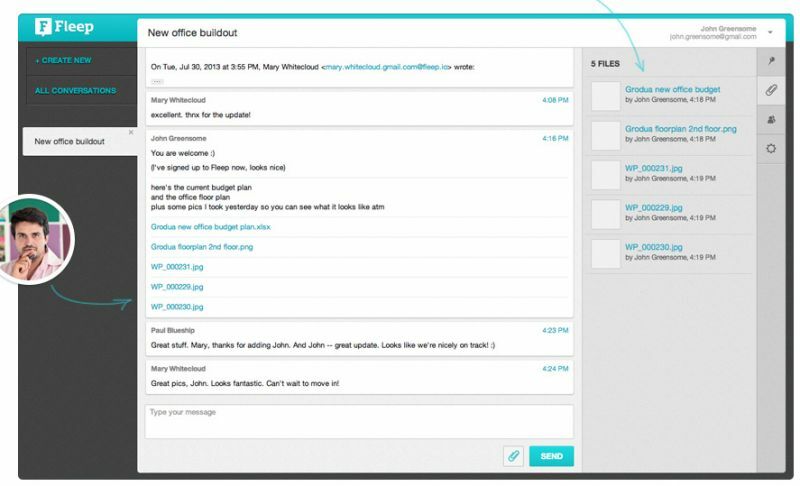 Another integration lets you share emails directly into Slack. Instead of copying and pasting or forwarding the email to a large group, you can click a Slack button in the Outlook interface and share it as a direct message with a group or to your personal Slack channel. 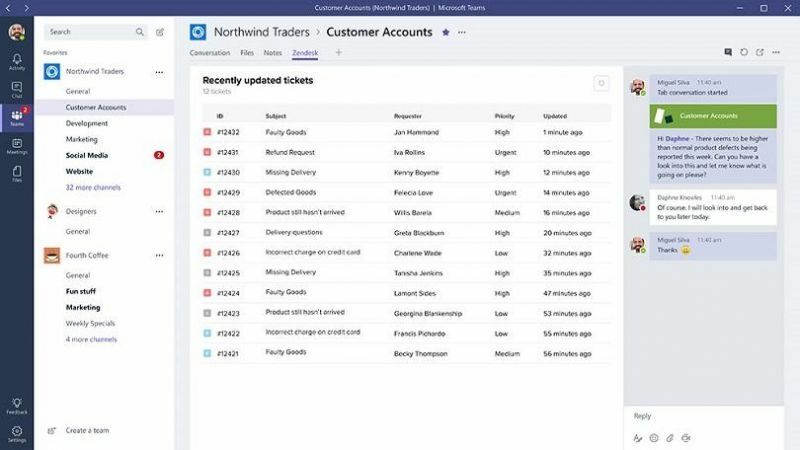 Microsoft Teams is adding a number of new features that will be coming as it works on native integrations of more of Microsoft’s own tools to give Teams more functionality and more relevance for a wider range of use cases. 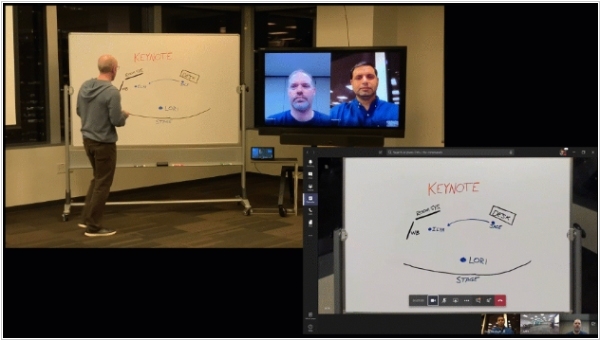 They include customized backgrounds; and support for cameras to capture content to bring in new ways of interacting in Teams beyond text — something that will be further explored with the eventual integration Microsoft Whiteboard, for people to create and ingest presentations that are hand-written into the system. For those who are either hearing-impaired or cannot use or hear the audio, Microsoft’s adding live captions. Finally, it is adding live events support, which will let users create broadcasts on Teams for up to 10,000 people (who do not need to be registered Teams users to attend). 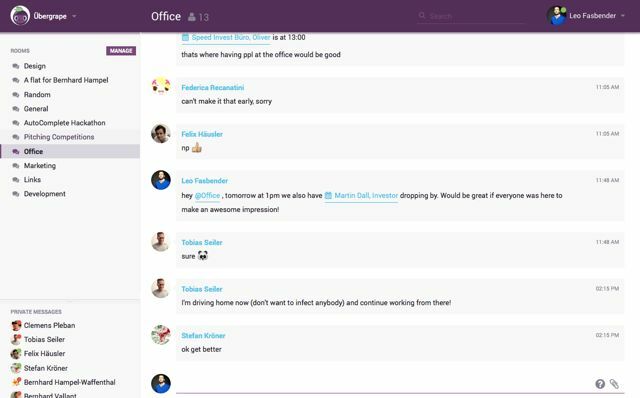 Microsoft Teams released several new features aimed at shift workers (also known as first line workers). For starters, Microsoft is making mobile Teams more flexible to meet the needs of a variety of shift worker jobs. Some might need to record and share audio messages, while others might need to share their location or access the camera. Whatever the requirements, Microsoft has started with a Firstline Worker configuration policy template, which IT can customize to meet the needs of various worker types. The mobile tool also includes a navigation bar, which allows workers to add the tools they use most often for easy access. The idea is to make it as simple as possible to access the tools they need, given that these workers tend to be on their feet or on the move a good part of the day. Crew, a messenger that specifically targets businesses that employ shift workers who do not typically sit at computers all day, has now raised $35 million. 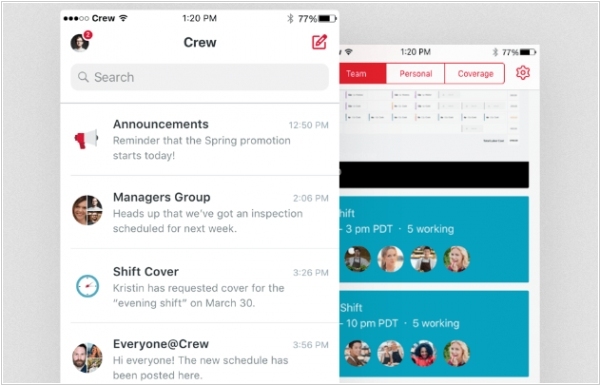 It’s also announcing the launch of a new feature called Crew Enterprise, which helps businesses better manage messaging across large groups of these workers. The company has 25,000 customers, many of them multi-store retailers with an emphasis in the food industry; household names like Domino’s Pizza and Burger King — with some strong engagement. There are quite a lot of messaging apps out in the market today, but the majority of them are aimed at so-called knowledge workers, people who might be using a number of apps throughout their day, who often sit at desks and use computers alongside their phones and tablets. Crew takes a different approach in that it targets the vast swathe of other workers in the job market and their priorities. 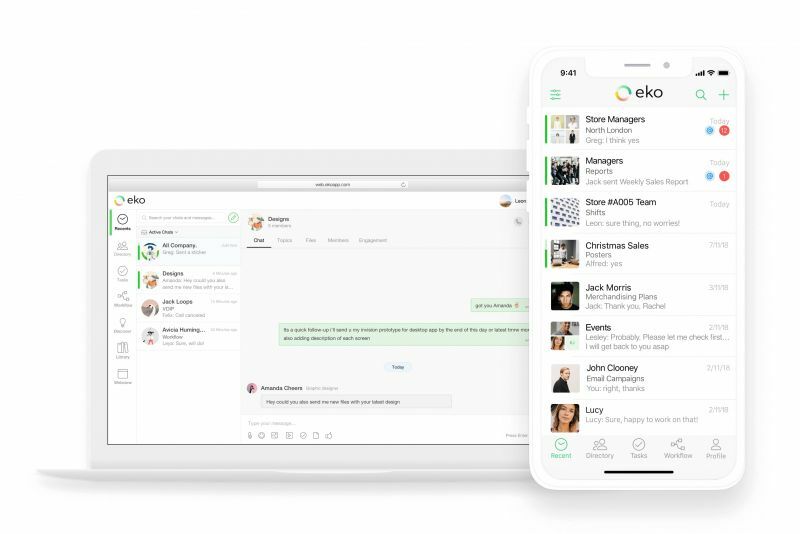 Group chat Zoho Cliq is getting some enterprise enhancements, while still remaining accessible to organizations of all sizes. 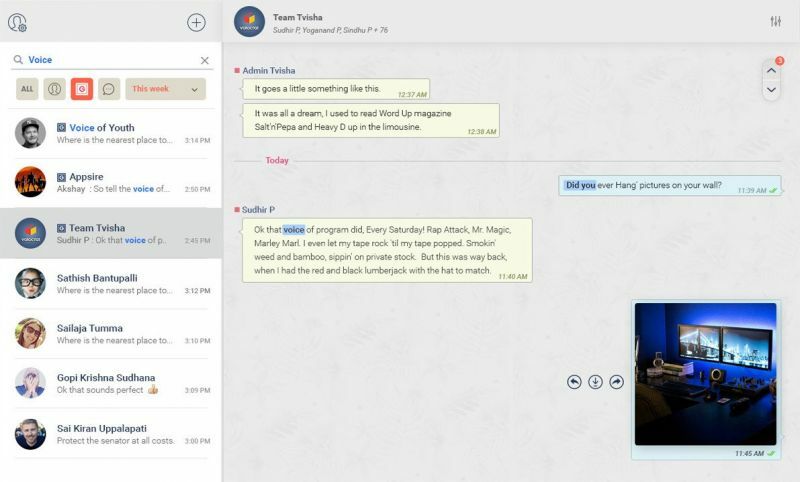 The revamped administration console will enable organization owners using Cliq to fully customize the chat experience for their users. This includes setting up finer control on permissions, user profiling, and personalized themes for your organizations. The admin console enables you to add users to different teams and departments, as well as set their designations within them. 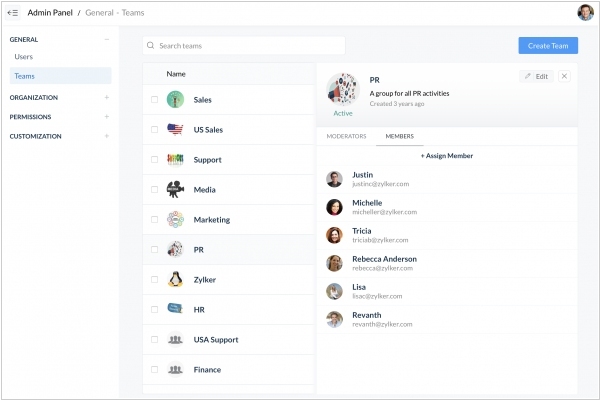 As the super admin of your organization, you can add as many admins or moderators as you need. Not satisfied with just default roles? You can add your own for specific tasks, like platform developers who can create and manage bots for the organization. Besides now you can personalize your Cliq to your heart’s content—set your own icons, create your own color scheme for your client’s theme, and add a custom domain.